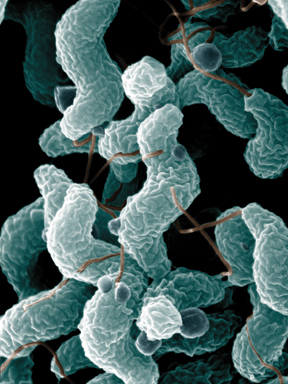 Campylobacter jejuni, a pathogen found in chickens, is the nation’s leading cause of foodborne bacterial diarrhea, so poultry producers look for ways to control it before the birds go to processing. The bacterium is susceptible to stress — so what keeps it going? It seems the bug latches onto colonies of bacteria — biofilms — and uses them as places to thrive in ways the Campylobacter jejuni would be less likely to do on its own. “The capture of C. jejuni could be correlated to the amount of biofilm present,” said Irene Hanning, a post-doctoral associate in food science at the University of Arkansas System Division of Agriculture who investigated the issue for the Food Safety Consortium. Many bacteria can form a biofilm, an assemblage of bacteria encased in a sticky substance. A biofilm provides protection from threats to bacteria’s existence. C. jejuni has had a major disadvantage in that it doesn’t do well at making its own biofilm. So instead, it moves into other biofilms. The hosts can be any of several bacteria, but C. jejuni’s most prevalent host turns out to be Pseudomonas, which also serves as the main spoilage bacteria on chicken carcasses, Hanning said. Hanning looked at the ability of C. jejuni to survive from biofilm populations isolated from four places: a drinking unit in a chicken house, a drain under a plucker in a processing plant, a retail chicken carcass and a crate used to haul live chickens. No C. jejuni was found on the growth surfaces outside of biofilms that had already been established. PreviousWhat is a “smart building”?